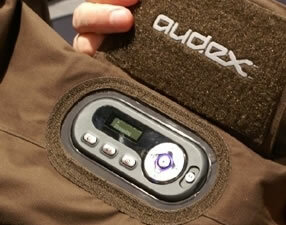 Motorola has introduced a cool AUDEX jacket with built-in speakers for use with a digital audio player. Shown at CES. Users can let the device play music from their mobile phones via Bluetooth. The AUDIX jacket also has excellent sleeve controls. 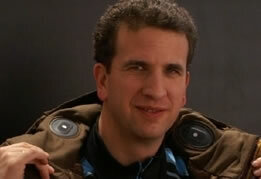 I'm fascinated with clothing that has controls built in; I keep thinking that the sleeve communicators from Murray Leinster's First Contact, the 1945 science fiction story in which the phrase "first contact" is originally used to describe the initial meeting of humanity with extraterrestrial life, are now here. He pressed the button in his sleeve communicator and snapped: "Action stations! Man all weapons! Condition of extreme alert in all departments immediately!"